I haven't been blogging as much as usual lately because we have been in the design studio working on some very exciting online design projects. I'm humbled by the response I received at the beginning of the year when I announced we are available for new clients. We still have openings but anticipate a spring rush very soon, if you would like to make a reservation now is the time (please click here for more information). This weekend, I was able to sneak away and put together today's post on a recent on-site kitchen makeover project I worked on here in the Detroit area for my long-time clients; Sara and Erik. Last week I shared with you before and after pictures of this project along with the story on the "old" kitchen. Today, I'd like to take you on a tour of the new space and share all the details on how this brand new custom kitchen came together. This makeover began by weighing the option of custom cabinetry versus pre-fabricated cabinets. After discussing their wants and needs for the new kitchen, Sara and Erik decided the custom route was best for them. This approach would allow them to incorporate some amazing custom details that would give their home a look of it's own. Not to mention, it would function perfectly for the way Sara, Erik and their two children use the space. One of the first things you'll notice in the new kitchen is this gigantic custom vent hood featuring a deep ledge and chunky corbels. It provides an amazing focal point. For now, we left the ledge undecorated to celebrate the simple beauty and fantastic craftsmanship of this architectural feature. Sara will have the option of adding seasonal accents or decorative accessories to the shelf as the mood strikes, but in the meantime it stands beautifully solo. Under the gourmet cooktop, large, deep, soft close drawers provide perfect storage for pots and pans. If you take a close look, you will notice that the section of cabinetry to the left of the of the cooktop features a set of doors and in the section to the right of the cooktop small drawers were incorporated. The overall look of this row of cabinetry is symmetrical, yet the variation in the cabinet type lends visual interest. The smaller drawers on the right are perfect for cooking utensils and spices and the large cabinets to the left are great for large stock pots. In addition to traditional family dinners throughout the week for Sara, Erik and the kids, weekends in this kitchen are dedicated to entertaining and cooking for large groups of family and friends. These new high end appliances will allow Sara and Erik to do just about anything their little gourmet hearts desire. Big, home cooked family meals will be easy to prepare, serve and store with these extra capacity, state of the art appliances. 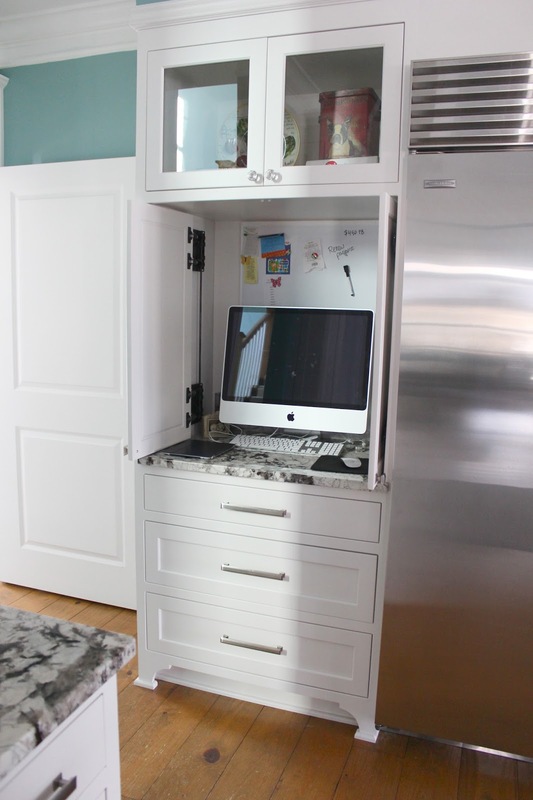 To break up the look of twin stainless steel refrigerators, one glass front door and one solid stainless door were paired together. Speaking of entertaining, the new, extra grand island is an entertainers dream. The multilevel countertop does a great job of providing a bar-height eating area large enough to comfortably fit three adults with plenty of counter-height working/serving surface to spare. Sara had a special request when this project began for an undermount farmhouse sink. Hats off to her for this idea, this is one of my favorite looks of all time. It gave her the charming farmhouse character of an apron front sink along with the sleek sophistication of a seamless undermount. The base of the island features custom storage on both sides and plenty of leg room under the bar area. 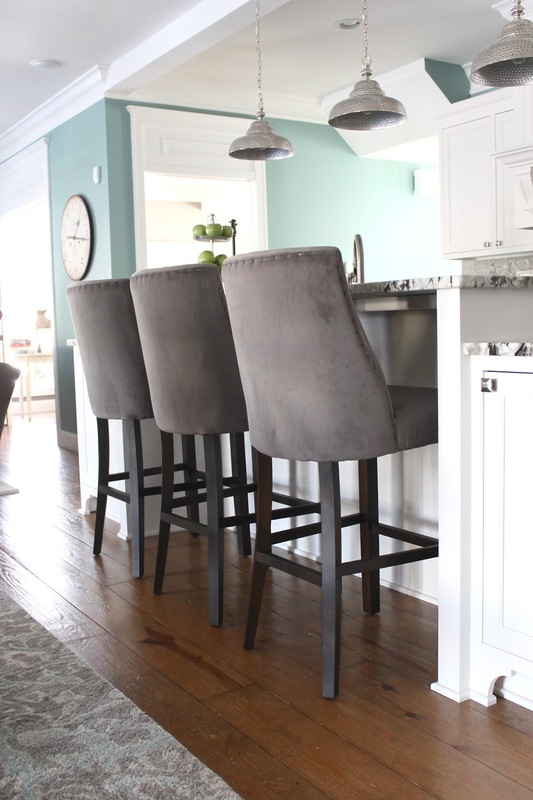 For the stools, we went with the amazingly comfortable barrel back, upholstered bar stools from Restoration Hardware. These barstools are extra sturdy and insanely comfortable. They are perfect for everyday use by the kids as well as weekend game days for the men in the family. The upholstery is a performance velvet fabric that is stain resistant and family friendly. The granite we chose has the most amazing depth and movement. At night, small metallic, crystalized flecks literally sparkle. As soon as we saw this slab at the granite yard, we knew it was the one. We used the granite as our color guide in choosing the greige (a gray based beige) backsplash. We weighed a few different options before deciding on this shiny, textured glass subway tile. Warm white grout provides contrast and really makes the color of the tiles stand out. The texture of the highly reflective finish makes it dance with natural light. It's hard to capture in a picture how this glimmering backsplash makes this kitchen come alive with light and movement. 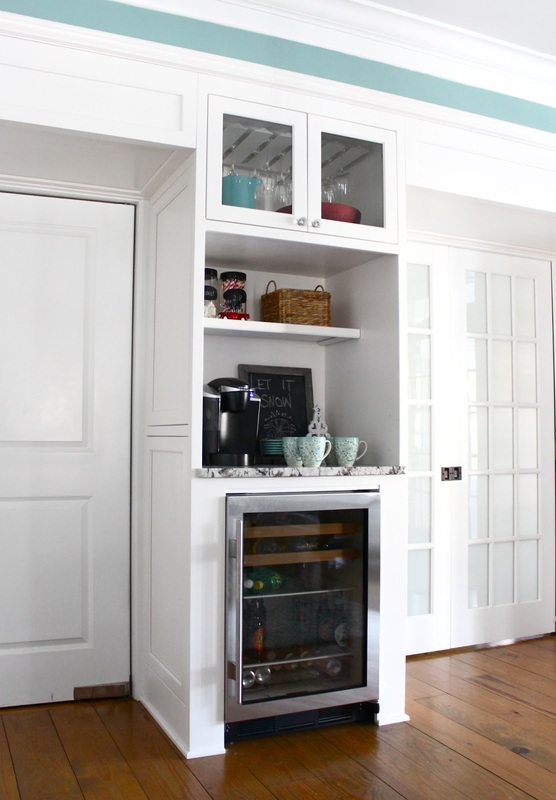 A beverage station was incorporated in the center, next to the swinging door leading to a walk in pantry. 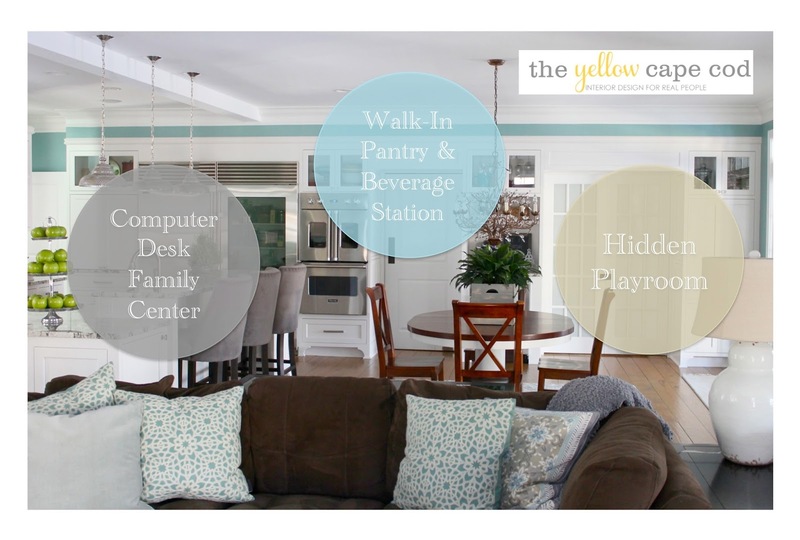 All the way to the opposite end of the play room is a family command center with self housing pocket doors. The doors remain open during the day for easy access to the family computer, mail, sticky notes etc. At night or while entertaining, the pocket doors close for a neat clean look. Sara's Dad (Rob Toth) helped out a lot during this kitchen renovation. He is a talented craftsman/carpenter and took many of the projects that needed to be completed on himself. One thing that is really a special addition to this new kitchen is the new dining table. It is actually an heirloom piece that was given to Sara years ago by her parents and has been kept in storage until now. While the cabinet makers were busy in the kitchen, Rob was busy in the workshop refinishing this beautiful pedestal dining table. The top was stained a rich chestnut color to coordinate with an existing Potterybarn Benchwright Console table in the space. He painted the base of the table white to match the cabinets. The contrast of the dark wood tone and white base really makes this piece stand out against the soft grays and turquoise found in the new area rug. 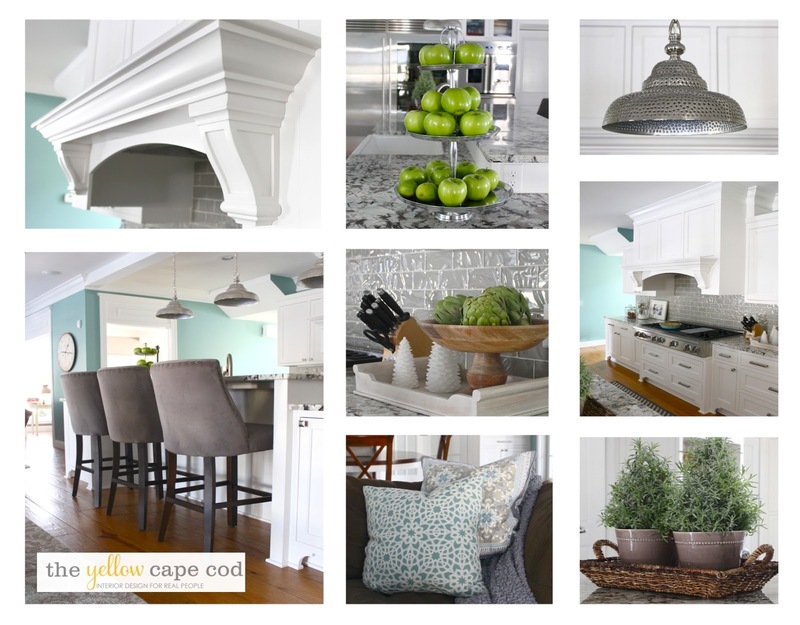 The color palette of the new kitchen was determined by the colors used throughout the rest of this home. 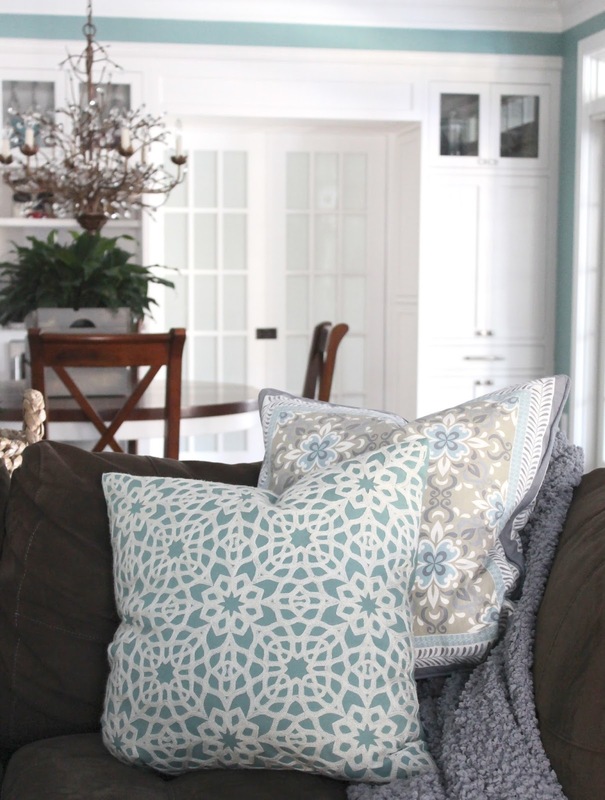 I'm in the process of creating a full home tour post sharing some of the other spaces we've worked on together. This has been one of my favorite projects of all time. In addition to being a beautiful house, what I love most about this home, is that it really tells the story of the family that lives here. It's a home that is filled with life; family photos, art, children, family, pets and happiness. Being able to assist with this kitchen project and help Sara and Erik's vision for a dream kitchen come to life has been a wonderful experience. *Now available for new online design projects. Please click here for more info. 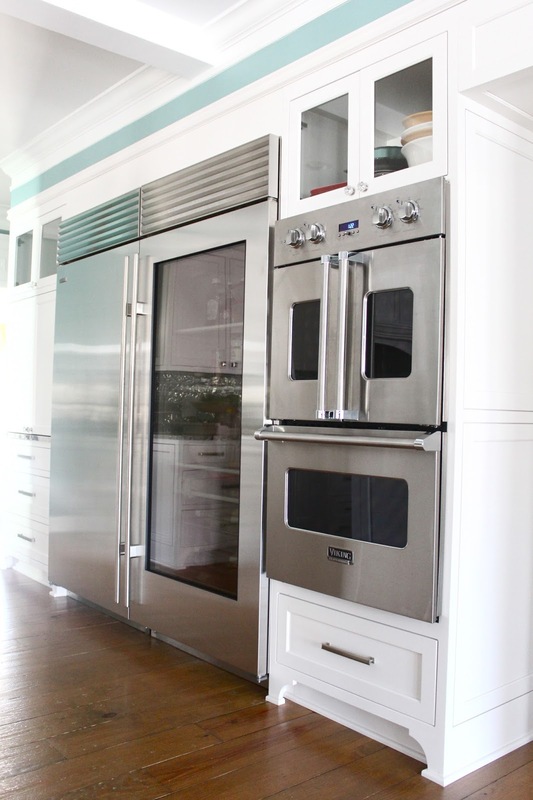 I'm obsessed with those appliances & the decor! Love it !!! That is a very pretty space. I really like the material and colour choices.